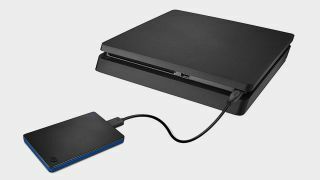 As of a spring 2017 firmware update, the PlayStation 4 is fully compatible with external hard drives. While it seems silly to complain about added functionality, the one issue we’ve taken with this change is that there aren’t a lot of SSDs out there that color-coordinate with our PS4s. Trivial as it might appear, style is an integral part of our home entertainment setups. If aesthetics didn’t count for anything, we wouldn’t be using a console that’s shaped like a parallelogram to begin with. That’s why, when the Seagate Game Drive for PlayStation 4 released late last year, our interest was immediately piqued. An external hard drive featuring the same blue and black color scheme that the PS4 has so famously brandished since November 2013? Count us in. Normally this is a hard drive that comes off as a bit overpriced since its 2TB variant costs $89.99, whereas you could buy a slightly more plain Seagate Expansion drive at the same capacity for just over $60. But because it’s Black Friday, the PS4-branded Seagate external hard drive is 25% off for the next few hours, making its price point a lot more digestible at $64.99 for 2TB from Walmart. The 4TB version of the same drive is on sale for $99.99, 23% off its $129.99 sticker price. Never run out of storage again with this powerful, portable and fashionable hard drive from one of the most trusted HDD brands. Regardless of which size you go for, the physical dimensions of the drive remain the same. This drive measures, 4.5 x 3 x 0.4 inches, which is small enough to carry around in your back pocket. This level of portability comes in handy for those times when you want to take your digital copy of Diablo III or Rocket League over to a friends house for some local multiplayer action without lugging around your entire console. So long as your PS4 is up to date with System Software version 4.50 or higher, the setup of the Seagate Game Drive for PlayStation 4 should be relatively simple. Simply plug it into one of the system’s two USB ports and a guided setup will take you through the formatting woes, a process Seagate claims takes under 3 minutes to complete. The company also suggests that 2TB is enough space to store over 50 games at a time. Being the USB 3.0 device that it is, the Seagate Game Drive for PS4 is well over 10 times faster than a legacy USB 2.0 drive would be, with theoretical transfer speeds up to 640MBps. Given that the PS4’s ports support up to USB 3.1 Gen1, this doesn’t technically reach the true potential of the console, but you will notice short load times nonetheless. For more great savings, check out our roundup of the best Black Friday game deals 2018 has to offer.